Below are artist renderings from the Environmental Study Report, of the proposed bridge design concept. Detail design and tender is anticipated to be completed by the end of 2019, which will be followed by construction in 2020-2021. Further public consultation, anticipated for late spring 2019, will be conducted during the Detail Design phase of the project. 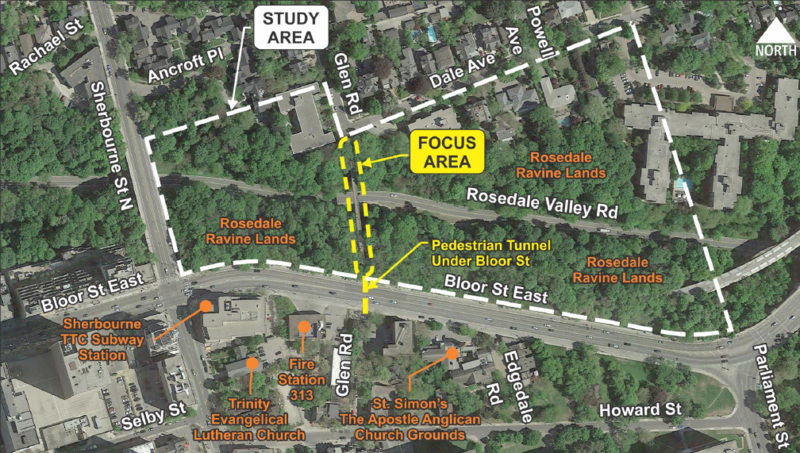 This pedestrian-only structure between Sherbourne Street and Parliament Street, spanning the Rosedale Valley Road, provides a north-south connection from the north side of Bloor Street East to the intersection of Glen Road and Dale Avenue. Study area includes pedestrian tunnel. 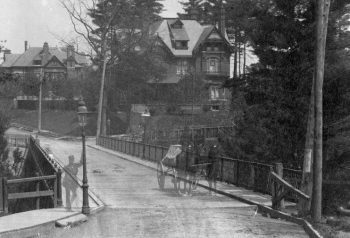 For over 130 years, Glen Road has had a bridge over Rosedale Valley, connecting the community of Rosedale to the city. This study respects the importance of this historic connection and will give appropriate consideration to the cultural heritage value of the bridge structure. The bridge is listed on the City’s inventory of heritage bridges and is part of the South Rosedale Heritage Conservation District. Transportation Services is working closely with Heritage Toronto to ensure the future of the bridge honours its history, and that heritage elements are preserved where possible. In 1992 a bylaw was enacted to formally change the name of the Glen Road Footbridge to the Morley Callaghan Footbridge. For this project, we use “Glen Road Pedestrian Bridge” for sake of local recognition. Previous bridge rehabilitation was completed in 2001. Emergency repairs on the structure were completed in early 2015, with ongoing annual inspections to ensure the safety of the bridge. Subscribe to the Glen Road Pedestrian Bridge & Tunnel project email list to receive project updates and notices of opportunities for participation. Information will be collected in accordance with the Municipal Freedom of Information and Protection of Privacy Act and the Environmental Assessment Act. With the exception of personal information, all comments will become part of the public record.